If you’ve undergone DNA testing, you should be able to download your raw DNA data and upload it to other websites for additional analysis (this is called "autosomal DNA transfer"). We’ve made a comprehensive and up-to-date list of the best websites where you can upload DNA data and find out more about yourself! 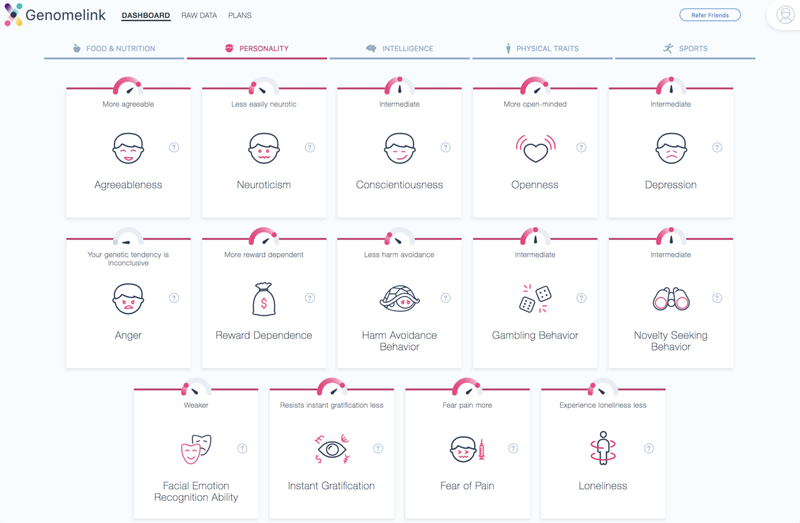 There is an overview of personality trait reports on the Genomelink Dashboard. 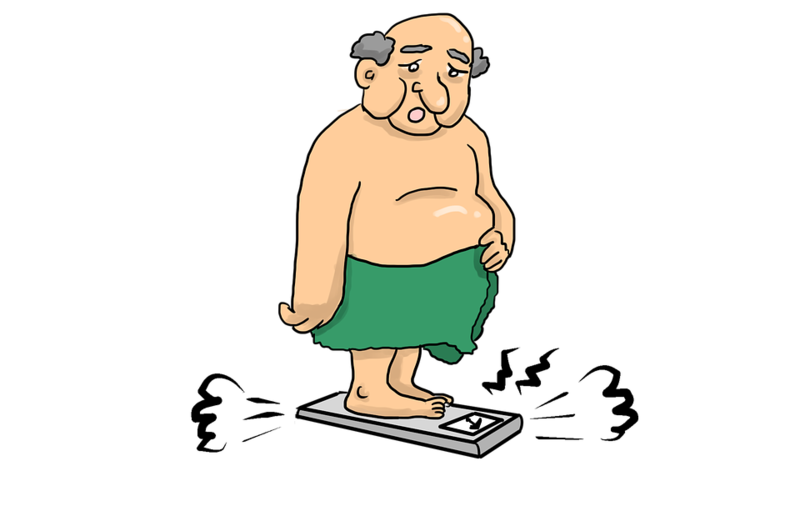 Other trait categories include nutrition, intelligence, fitness, and physical traits. The test results are presented through a very intuitive and beautifully designed interface! Genomelink presents your genetic predispositions for traits that influence how you live day to day. There are two plans: a NO COST plan in which you get free access to 25 traits, and a $14/month subscription in which you get a novel trait report every week. 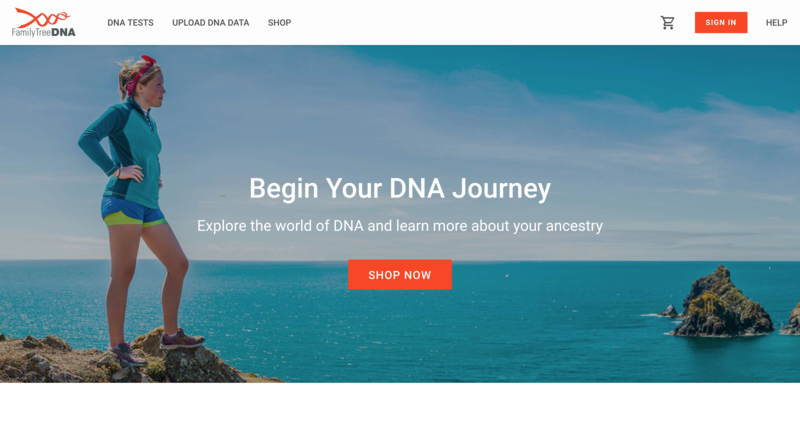 This service accepts raw data uploads from AncestryDNA, 23andMe and MyHeritage. This is a very informative service. The data is obtained from SNPedia. 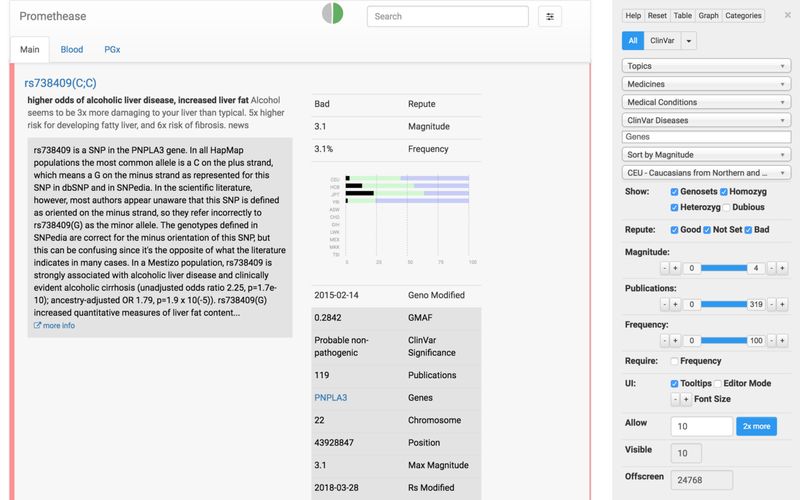 Promethease directly compares your DNA data with SNPedia, a wiki for human genetics. It provides information on the effects of genetic variants on phenotypes. Information is sourced from peer-reviewed scientific publications. If you’re new to Promethease, the interface can feel overwhelming, with several medical terms and filter options that may be difficult to understand. Here’s a beginner’s guide on how to pre-filter and pre-sort your results to make sense of your Promethease report. There’s an instruction video available on the homepage as well. LIFE NOME offers comprehensive testing options. 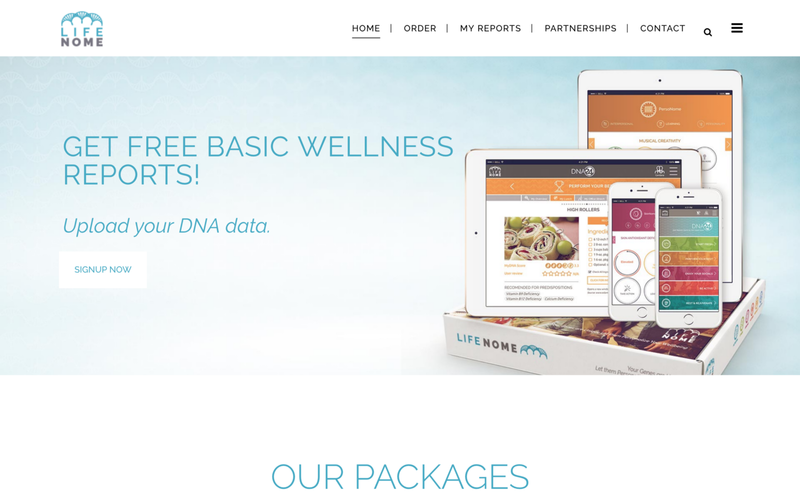 LIFENOME provides a comprehensive analysis of your DNA on nutrition, fitness, skincare, allergy and personality. Its AI+Genomics engine assesses the cumulative effect of multiple genetic variants that could impact your wellness. Results are based on thousands of peer-reviewed genetic studies. This service provides you with a state-of-the-art predisposition assessment. 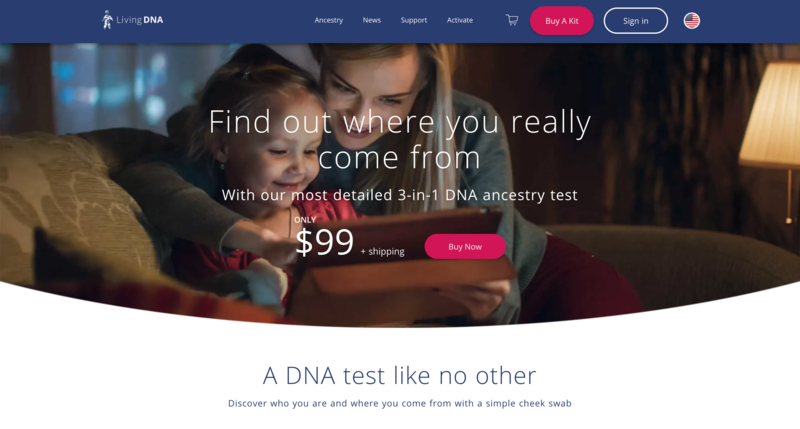 Besides 23andMe and AncestryDNA, MyHeritage is one of the most well-known ancestry DNA testing companies with their own DNA kits. Over the past 15 years, they have helped millions of people find new family members. Their ethnicity estimates may give you a second opinion about your ethnic roots. 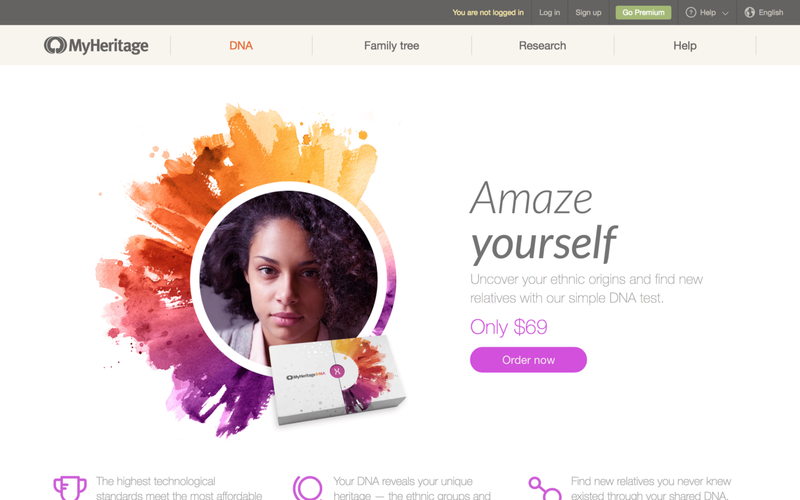 MyHeritage accepts DNA data uploads from 23andMe and Ancestry at no cost. Family Tree DNA is a great resource to connect to more of your family members for free! If you have already done 23andMe, Ancestry, or MyHeritage, you can upload your raw DNA data to Family Tree DNA and gain free access to autosomal matches with other family members in their database. For an additional charge, you can get your DNA tested with Family Tree to unlock your ethnic origins and relationships to ancient groups. Paternal line ancestry (if you’re male) and maternal line ancestry are also individually available (at an additional cost). Living DNA allows you to upload your raw DNA data for free to match with other family members in their Family Networks matching service. To find out more about your DNA through LivingDNA, you can purchase additional kits ranging in price from $99 to $168. This service has a simple interface designed for amateur and professional researchers and genealogists. 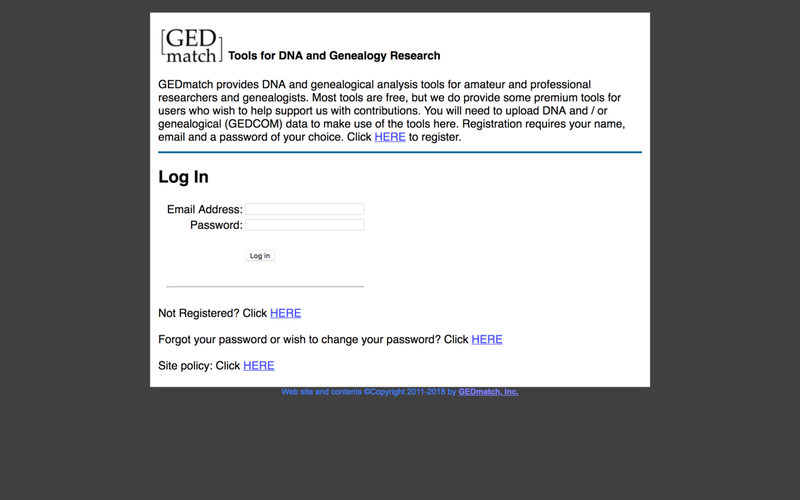 GEDmatch provides DNA and genealogical analysis tools for both amateur and professional researchers and genealogists. The chromosome browser (which matches specific bits of genomes between relatives) is amongst their most popular tools. Millions of users are registered on its relative match database with full contact information, including email address, first name, and last name. Again, this is a tool where the interface can appear busy with a heavy dose of technical terms. If you’re new to GEDmatch or struggling to make sense of it, use this beginner’s guide for instructions on which GEDmatch functions to start out with. They analyze 104 SNPs to give you a Genopalate Report that includes your ideal intake of certain nutrients. Genopalate analyzes your DNA for nutrition information, so you will know which specific foods are best metabolized and processed by your body. They analyze 104 SNPs to give you a Genopalate Report that includes your ideal intake of certain nutrients. 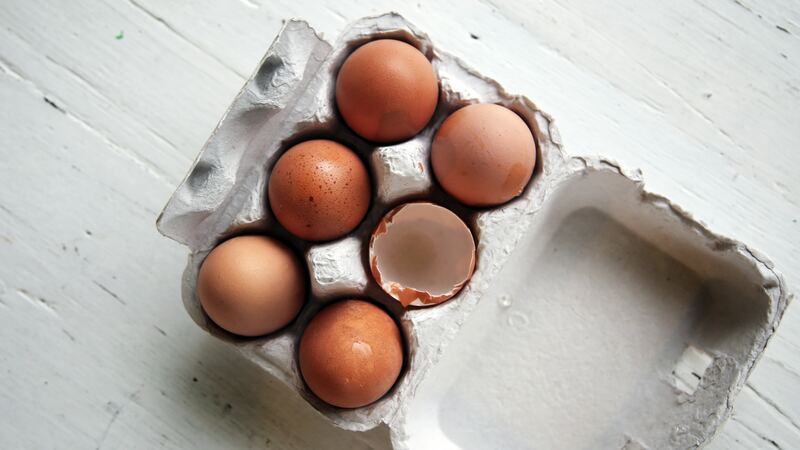 You’ll also get information on genetic variants that influence the foods you eat. 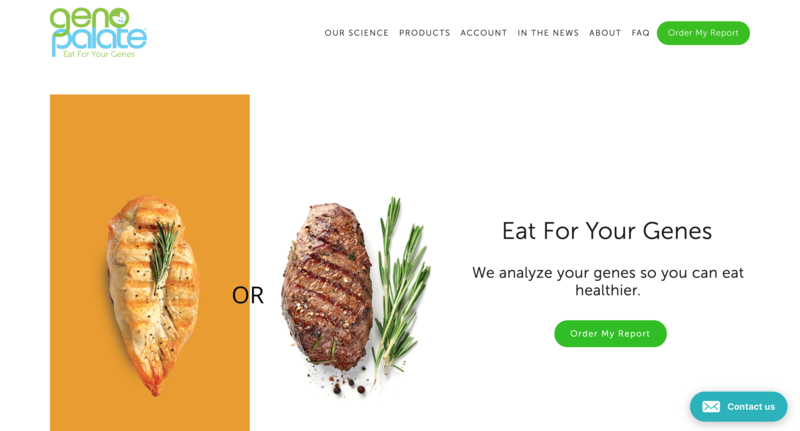 You’ll receive a list of 80+ foods chosen specifically for you based on your unique genetic profile. For an additional fee, you can purchase personalized menus based on your genetic information. These can assist you in eating the right kind of foods based on your genes! The company has partnered with the world premier training center, ALTIS, to provide personalized fitness reports. After you upload your raw DNA data for free, Athletigen analyzes your overall health and wellness by looking at how your DNA influences your response to nutrients, performance abilities, and recovery. They have also partnered with the world premier training center, ALTIS, to provide personalized fitness reports for an additional fee. 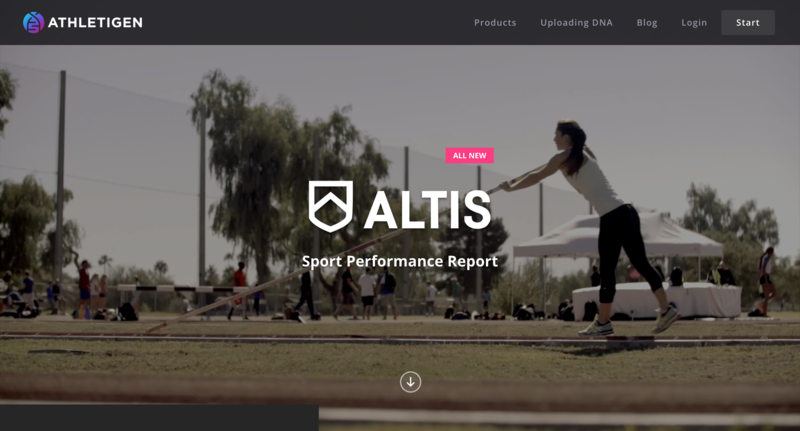 Among the different reports that can be purchased for an additional cost, the ALTIS Sports Performance Report is 35 pages of over 50 markers and 22 traits analyzed specifically for you. Vitagene gives you diet, supplement, skin, and fitness reports personalized from your DNA. These reports help you understand and improve your overall health and wellness. 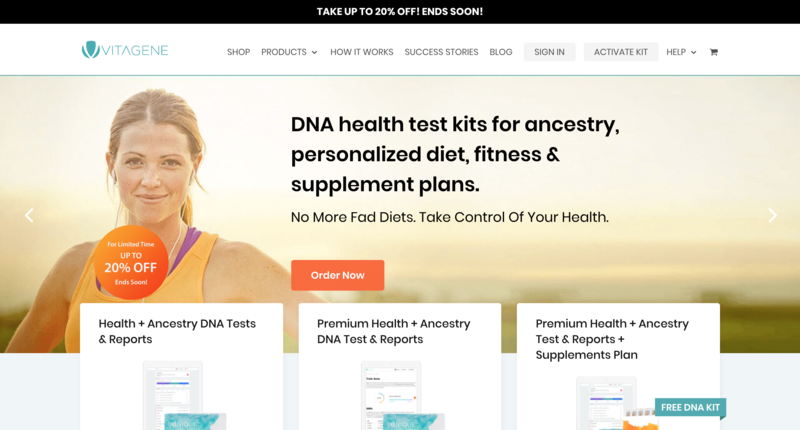 In addition to the reports, Vitagene takes orders for personalized supplement packages based on your genetic information. You can discover the actions you should take to achieve your fitness goals! You can get 31 personal insights and 18 recommended actions as well as an FG Pro compatible insight summary report. You will also receive a nutrition guide with supplement recommendations and personalized recipes. Finally, you’ll get a free 1-week sample workout tailored to your genetics. In partnership with Gold’s Gym, FitnessGene gives you insight into things that impact your fitness and health, such as sleep, skipping meals, muscle fiber profile and much more. 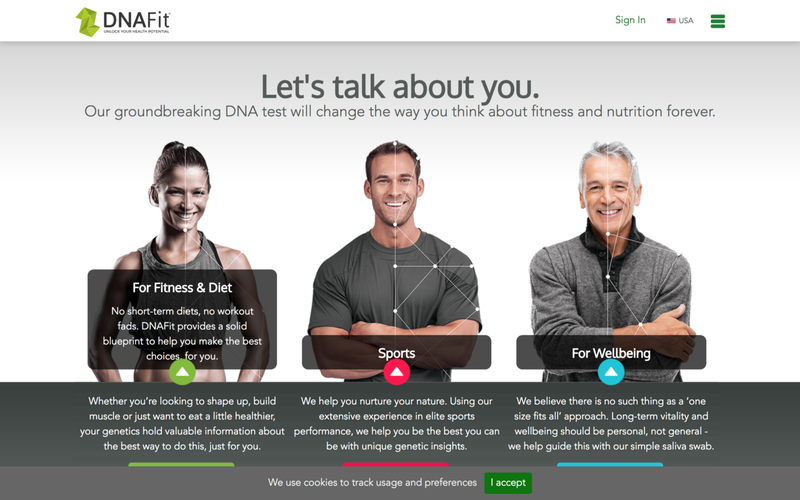 DNAFit focuses on fitness and nutrition. 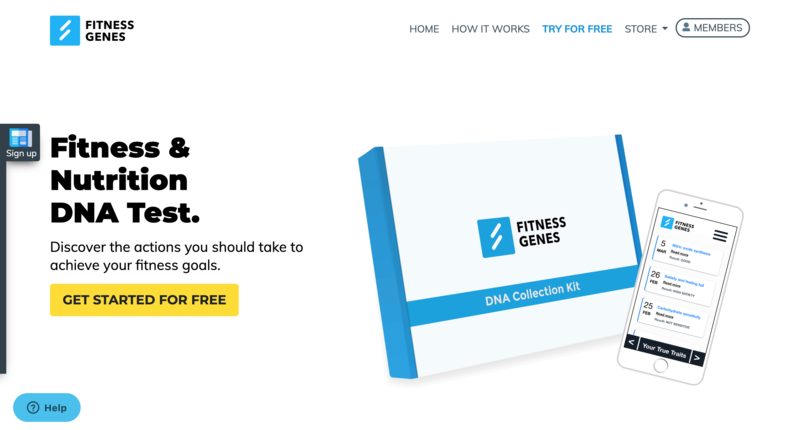 DNAFit focuses on fitness and diet. The genetic traits covered by DNAFit include antioxidant needs, detoxification ability, endurance performance, power, injury risk, recovery from exercise, and more. 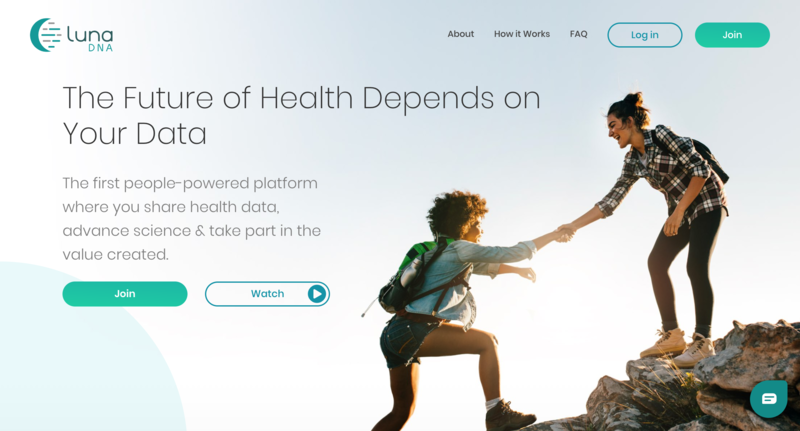 The first people-powered platform where you share health data, advance science & take part in the value created. LunaDNA gives you the opportunity to become directly involved with genetic research. It is a community-owned platform created by the Public Benefit Corporation, Luna PBC, along with a team of genomics researchers. When you share your raw DNA data with LunaDNA, you become part of a database that supports research and large-scale studies with the hope of achieving medical breakthroughs. As a benefit, you receive shares that you can keep or donate. When proceeds are achieved from studies, you receive dividends. They are also creating a currency called Luna Coin, following the trend in digital currency, in order for community members to be rewarded monetarily. It is a non-profit run by academics affiliated with Columbia University and the NY Genome Center. DNA Land is working on scientific research through analysis of human genomes. It is a non-profit run by academics affiliated with Columbia University and the NY Genome Center. You contribute your raw DNA data and DNA Land provides you with ancestry information, trait predictions, and any relatives that may be in their database. 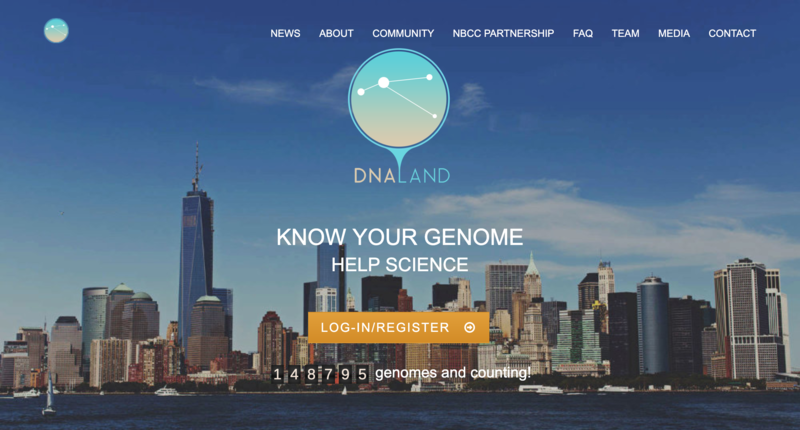 DNA Land has partnered with the National Breast Cancer Coalition (NBCC) to better understand the genetic risk for breast cancer. Wouldn’t you love a beautiful piece of art designed with your DNA data? I’m thinking of getting something from here! Dot One was set up with the aim of taking genetics out of the lab and into the public domain to make it more accessible. 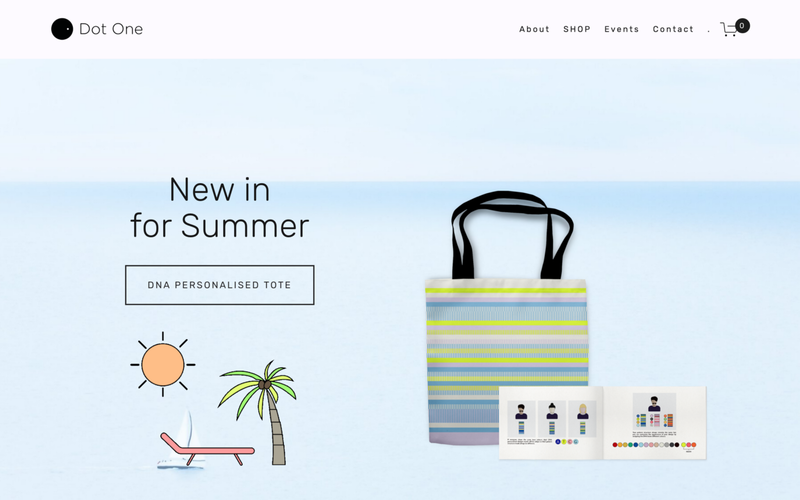 The company makes customized tartans, scarves, T-shirts, socks and print materials based on your DNA sequence. I’m trying this right now… let’s see if I find the best partner for my DNA! 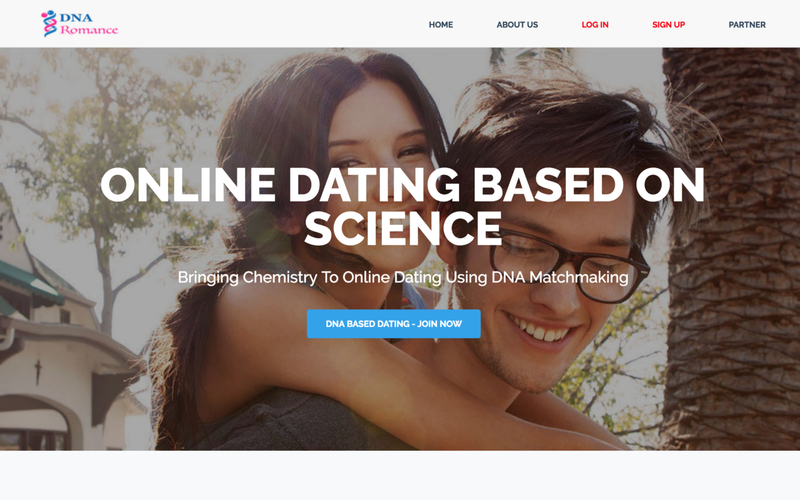 DNA Romance finds the best partner for you based on your DNA data and the Myers Briggs personality test. The science backing this up is based on the relationship between scent and attraction. This is an app store for DNA data. There are a variety of apps you can explore. 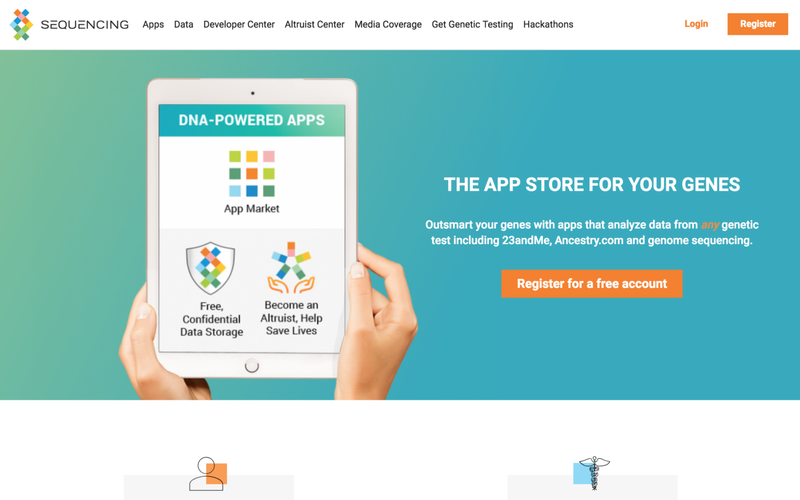 As an app store for DNA data, Sequencing.com provides free, confidential storage of your genetic data and access to a large selection of apps that transform this data into useful information. Currently it partners with companies like LIFE NOME. Did you find anything interesting? Clap if you liked this post! I’d love to hear your experiences with the products and services I’ve listed above or anything else you’ve tried. Please leave your comments and share what you’ve found!